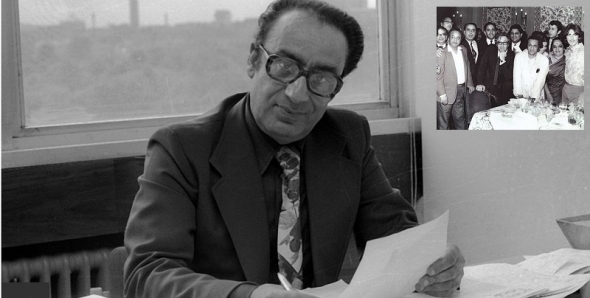 ONE OF THE VETERANS of British Broadcasting, Mahendra Kaul, OBE, passed away recently and his funeral took place at Golders Green Crematorium on July 22, and was attended by family, friends and prominent public figures. He was 95. Kaul was a regular face on BBC television and used to present the magazine programme, ‘Naya Zindagi Naya Jeevan’ (NZNJ) (‘New Way, New Life’), which was broadcast from 1968 – 1982. Among the mourners were Lord Navnit Dholakia, who was Head of Administration of Justice at the Commission for Racial Equality (1974-1994) and one of the people Kaul used to be in regular contact for his programme. Along with producer, Saleem Shahid, Kaul presented the show, which was produced at Pebble Mill, Birmingham and was a regular viewing staple for the Asian community on a Sunday morning. It focussed on local and international (Indian subcontinent) news, interviews with eminent British politicians, music performances, Bollywood actors and provided information to the Asian community on how to integrate into Britain, and was presented in Hindi/Urdu and English. One of the strangest pieces of information he had to give out was to get the Asian community to stop using hair oil. What he meant was that when the Asian people were sick and went into hospitals the bed sheets and pillows were stained with the oil and so “I very humbly and gently put this point across”. Apart from such incidents, Kaul also interviewed many political and showbiz personalities. He met The Queen in 1981 when she visited the studios in Birmingham and also met then Prime Minister Margaret Thatcher in Downing Street. Legend has it he flirted outrageously with her and also asked her to appear on his programme. He also met people like actors, Dilip Kumar, Raj Kapoor and Peter Sellers, musicians, Ravi Shankar, George Harrison, and tabla maestro, Alla Rakha. Mahendra Nath Kaul, was born in Srinagar in 1922 at the time of the non-cooperation movement in India, and grew up in Jammu and Kashmir, as a Kashmiri Pandit. He lost his mother aged nine and was always a politically conscious young man. He tried to be an actor, and appeared in a scene alongside the actress, Nargis in Khwaja Ahmad Abbas’s directorial debut, ‘Anhonee’ (‘Happening’) in 1952. However, journalism was more his calling and he got a job in Radio Kashmir presenting ‘Jawabi Hamla’ (‘Counter Attack’), a popular and controversial show, which got him noticed and brought him to All India Radio, Delhi, where he met his future wife, Rajni, a broadcaster who worked there. He went on to work with Voice of America from 1955 – 1960 where he created its Indian services division, but he arrived in McCarthy’s America and didn’t totally find himself fitting in. He wrote some speeches for Richard Nixon. In 1961, he came to the UK to work for the BBC External Services and then later, ‘Naya Zindagi, Naya Jeevan’. Restaurateur, and founder chairman of Old World Hospitality Group & Cinestaan Film Company, Rohit Khattar, a protégé and family friend, gave a moving eulogy where he described how he first met “Mahindra Uncle” when he came to the UK in 1996 to run one of his restaurants. Alongside his broadcasting career, Kaul, along with his partners Iqbal Ghai, PL Lamba and his best friend, Hari Harilela, was the original ‘curry king’ and in the 1960s, introduced the British palate to authentic Indian food, and had a tandoor brought over from Kashmir. He created the Gaylord chain of restaurants – the original one can be found in Mortimer Street, London which opened in 1966. It is now Indian Accent. It was during those years that they became god parents to Rashmi and me and Kaul Dada and Rajni Dadi to our children. One of the bedrooms in their home is permanently called ‘Rohit’s room’ and so it was for the first 15 years that we visited London. They would not have it any other way. More importantly, they gave us a place in their hearts and cared for us as only elders in a family can. In 1975, Kaul was awarded an OBE for Race Relations, a rare accolade then to be given to an immigrant, and someone of Indian origin. In his private life, he enjoyed cooking Kashmiri food, Johnnie Walker Black Label whisky and was fond of reciting Urdu poetry. He leaves behind his wife, Rajni, their daughter, Kalyani Kaul, QC and his grandchildren, Symran and Callum Lee.